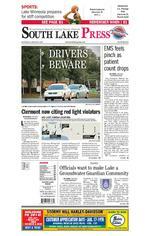 Wednesday, January 8, 2014 SOUTH LAKE PRESS A3 rfntbrttn tbftff rfntbrfnrrfnnttb rfntfbtnf Mon. Fri. 9am to 4pm, Sat. by appointmentLAKE COUNTYS MOST TRUSTED NAME IN HEARING AIDS www.lakemedicalhearing.com Alan Boone, HAS, BC-HIS President & Wife Linda221 N. US Hwy 27, Suite H(Across from the Citrus Tower)CLERMONT243-HEAR ( 4327 )2755 S. Bay St. Suite F (Across from Tractor Supply Company)EUSTIS483-HEAR ( 4327 ) LIVI STANFORD | Staff Writerlivi.stanford@dailycommercial.comAfter recently los ing her job, Amanda Cuevas said she is not even considering signing up for health insur ance under President Obamas Affordable Care Act. I couldnt afford it, the 31-year-old mother said, explaining that her priorities are providing for her children, who are covered under Medicaid. I am trying to get by. Cuevas is not alone. Several people, ages 18-34, known as the young invincibles, said last week that signing up for the plan was not a priority while others said they were still thinking about it. Indeed, the young demographic has become disenchanted with the presidents sig nature health care law. According to a fall 2013 Harvard Insti tute of Politics survey of 2,089 18to 29-yearolds, conducted from Oct. 30 to Nov. 11, a solid majority, 56 per cent, disapprove of the Affordable Care Act. Less than three-inten uninsured Millen nials say they will de nitely or probably enroll in insurance through an exchange if and when they are eligible, the survey stated. Harvard Institute of Politics Polling Director John Della Volpe said in a statement that the re sults were indicative of young Americans low approval of the presi dent and Congress. Young Americans hold the president, Congress and the federal government in less esteem almost by the day, and the levels of engagement they are having in politics are also on the decline, he said. On his way to the Lake-Sumter State College campus, Jessie Santos said signing up for health insurance was not at the top of his list. It is not important to me, he said. I have a lot more busy things to do. It is just on the back burner. Asked if he worries about getting sick, San tos shook his head, adding that he only gets sick once a year: a non-event for him. According to healthcare.gov, those who do not sign up for cover age by March 31, 2014, will have to pay $95 per person a year or 1 per cent of their gross in come. That fee will be increased every year, the website states, amounting to $325 per person beginning in 2015 (or 2 percent of income), followed by $695 per individual in 2016 (or 2.5 percent of income). Cuevas said she is concerned about the penalty, but said buy ing health insurance is not practical now. While Mary Reed, 32, has health insurance, her husband does not. He hasnt bought it yet, she said, also citing nancial difculties. The law, which went into effect Jan. 1, an gered Reed. I dont feel people should be forced to do it, she said. There are urgent care clinics for those (without insur ance). What happened to our free rights? she asked. As she exited the bus at LSSC, DAndrea Poole held her 1-yearold daughter, Brooke, closely. The 19-year-old LSSC sophomore said while she is covered by Med icaid, she said it is important young people sign up for coverage. But signing up should be easier, she said. They need to make the process as simple as possible, especially if they want the young er adults to get in volved, she said.They need to make it more accessible. Poole said friends in her age group are non chalant about signing up. Most of them dont go to the doctor, she said. Even if they do, I am sure it is pretty ex pensive. Cuevas cringes when thinking of the costs of going to a doctor without health insurance. When you get sick, if you have to go to the doctor, it costs a for tune, she said. You are lucky to pay the bill. The Affordable Care Act has already insured 3.1 million young adults who are allowed to stay on their parents plans until age 26, ac cording to the White House. The law also prohibits insurance companies from denying individuals under 19 years coverage based on pre-existing con ditions, according to specics on the law. According to the Associated Press, there are numerous national cam paigns from support ers and detractors of the health care law to sway young invincibles. If there are not enough young people signing up for health insurance, it could cause insurance rates to increase dramatically, the AP stated. Currently, there are million uninsured 19-36 year olds, ac cording to the U.S. Census Bureau. This group account ed for percent of the uninsured population under the age of 65, the Census reported.Young invincibles not jumping to sign up for Obamacare THERESA CAMPBELL / STAFF WRITER DAndrea Poole, 19, holds her daughter Brooke. While she does not need to get coverage because she is insured through Medicaid, Poole said it is important that young adults sign up. But, she said, the process should be simpler. Wednesday, January 8, 2014 SOUTH LAKE PRESS C3 CLERMONT BLESSEDSACRAMENTCATHOLICCHURCH English: 4 pm and Spanish: 7 pm 8 am, 10 am, 12 noon (Contemporary Mass) 5 pm (Contemporary Mass) 3:00 pm 3:45 pm (Eng.) 6:15 pm 6:45 pm (Sp.) Corner of Hwy 50 & 12th St. (Rt 561) CROSSROADSAMILYELLOWSHIPChristian Non-Denominational Where our priority is God, Families & Community 15701 S.R. 50, #106 Clermont, FL 34711 At Greater Hills and Hwy 50 Sunday Worship 9:30 a.m. Wednesday Bible Study 7:00 p.m. Children classes both services Men and womens monthly meetings Open prayer Tuesdays at 10:00 a.m. Sr. Pastors Jim and Linda Watson Assoc. Pastors Lee and Vanessa Dobson www.crossroadsfamilyfellowship.org crossroadsfamilyfellowship@gmail.com Phone: (352)242-1144 God is good...all the time! IRSTUNITEDMETHODISTCHURCHEncountering Christ, Growing in Christ, Sharing Christ, wherever we are... 950 Seventh Street 352-394-2412 Pastor: Rev. Doug Kokx www.fumc-clermont.org Sunday Worship (Traditional) 8 & 11:00 am Sunday Worship (Contemporary) 9:30 am Sunday School 9:30 am & 11:00 am Bible Studies & Childrens Activities: Sun. Night Children/Youth/Middle School 5-6:30 pm Sun. Night High School Activities 7-8:30 pm Wed. Night Dinner & Fellowship $6pp, 5-6:30 pm Weekday School: Preschool GRACECOMMUNITYCHURCHCLERMONTL Many Other Activities each week Jon Bekemeyer, Senior Pastor 407-877-4048 www.communitychurchclermont.org LIBERTYBAPTISTCHURCH Bible Fellowship Groups 9:30 am Worship Service 10:40 am Family Prayer Service 6:00 pm Bible Study 7:00 pm Groups for adults, teens, and children Chris Johnson, Senior Pastor For directions and more information, visit: 11043 True Life Way Clermont, FL 34711 352.394.0708 NEWACOBSCHAPELMISSIONARYBAPTISTCHURCH Pastor: Rev. Rex Anderson Assistant Pastor: Rev. Darryl Church Youth Pastor: Rev. Tone Lundy Church Clerk: Mrs. Lucressie D. Mcgriff Church Motto: Equipping Changed People for A Changing World! Schedule of Worship Services Sunday Morning Service 11:00 a.m. Youth/Adult Bible Study Thursdays 6:45 p.m. e-mail addresses: newjacobschapel3@aol.com (Pastor Anderson) thechapel2013@gmail.com (Church Clerk) Contact: Lucressie Mcgriff 352-348-7955 REALLCHRISTIANCHURCHHelping Real People Find Real Faith Saturday 6:00pm Sunday 9:30am, 11:15am & 6:00pm Vida Real (en espaol), Domingos a las 6:00pm Family Night is every Wednesday! Lil Life Groups (Nursery 5th grade) 6:30-7:30pm The Way (Middle School) 6:30-7:30pm Catalyst (High School) 7:30-8:30pm Real Parenting 6:30-7:30pm SOUTHLAKEPRESBYTERIANCHURCH 131 Chestnut St., Clermont 352-394-2753 East Ave 1 block south of SR 50 Worship Times: Sunday 9 AM (Contemporary); 11 AM (Traditional) Church school for all ages 10:00 AM Childcare provided Youth Group Wednesdays 6:30-8:30 PM www.southlakepresbyterian.org ST. MATTHIASEPISCOPALCHURCH574 West Montrose Street Clermont, FL 34711 352.394.3855 www.stmatthiasfl.com 8:00 am 10:00 am Beginning Oct. 6, 2013 5:00 pm Service Sunday School Youth Group Nursery Adult Bible Study Womens Bible Study Mens Prayer Breakfast WOOTSONTEMPLECHURCH GODINCHRISTElder T.L. Wootson 836 Scott St. Clermont, FL 34711 394-1396 or 394-3004 Sunday 11:00 am & 7:30 pm Thursday 7:30 pm FERNDALE ERNDALEBAPTISTCHURCHat CR455 & CR561A 407-469-3888 Pastor: Gordon (Bird) Sanders Sunday School: 9:15 am Sunday Morning Worship: 10:30 am Evening Worship & Discipleship Study: 6:00 pm TeamKid: Sunday 6:30 pm Wednesday: 7:00 pm Prayer Service, Youth Activities, Mission Kids for Children Groveland ABUNDANTBLESSINGSMESSIANICCONGREGATION756 W. Broad St. Groveland, FL 34736 Marion Baysinger Memorial Library Tuesday at 6:30 pm Jew & Gentile One in Messiah 352-544-5700 IRSTBAPTISTCHURCH GROVELAND Sunday School 9:45 am Sunday Services 10:50 am & 6:00 pm Wednesday Service 6:30 pm MT. OLIVEMISSIONARYBAPTISTCHURCHSunday Worship Service 11:00 AM Sunday School 9:30 AM Bible Study Wednesday 7:00 PM Youth Bible Study Wednesday 7:00 PM Come As You Are. All Are Welcome! MINNEOLA CONGREGATIONSMINNEOLAA Progressive Jewish Congregation Shabbat services are conducted every Friday at 7:30 pm Services are held at the synagogue located at: 303A North US Highway 27, Minneola Religious School, Mens Club & Womens Club TLIVINGGOD Sunday School 9:30 am Sunday Worship & Childrens Church 11:00 am Sunday Evening Worship 6:00 pm Wed Worship & Youth Service 7:00 pm Rev. Loyce Rowland MONTVERDE WOODLANDSLUTHERAN15333 CR 455, Montverde, FL 34756 407-469-2525 www.woodlandschurch.com Pastor Rev. Dr. Brian Kneser Sunday Service 8:30 am & 11 am Sunday School 9:45 am OAKLAND PRESBYTERIANCHURCH218 E. Oakland Ave. (1/2 mile N. Hwy 50 at Tubb St./ West Orange Lumber) 8:45 am Contemporary Worship 9:45 am Sunday School For All Ages 11:00 am Traditional Worship Nursery Provided All Services 407-656-4452 Dr. Robert P. Hines, Jr. www.oaklandpres.org Gathering PlacesSpiritual WorshipforSouth Lake South LakeGathering PlacesSpiritual Worshipfor BECKERFUNERALHOMErfn tbt352-394-7121806 W. Minneola Ave.,Clermont,FL Cremation ChoicesDirect Cremation$675Plus Container Ron Becker,Director352-394-8228921 S.US Hwy 27,Minneola,FL N EW R EFORMED P LANT C HURCH We meet our God on Sunday at Superior Residence at 10:30 AM. 1600 Hunt Trace Blvd. (Behind Home Depot)Pastor Harm Biehl 407-325-8663 Get OutGo!& My greatest achievement, and I am sure my husband would agree, is my daughter. 5) Whats something youve always wanted to do but havent yet? I have always wanted to go to Mt. Rushmore. 6) What advice would you give to people who want to help out in the community? Go for it. Being a part of a cause feels great. NEIGHBORFROM PAGE C1 COMMUNITY CALENDAR WEDNESDAY BOOK SALE AND USED TEXTBOOK SALE AT THE LI -BRARY: From 10 a.m. to 4 p.m., Helen Lehman Memorial Library, 17435 5th St., Montverde. Call 407-469-3838 for infor -mation. CANASTA AT THE LI BRARY: At 2 p.m., Jan. 8-29, Marianne Beck Memorial Library, Howey-in-the-Hills. We provide the cards. Snacks are welcome. Call 352-324-0254. FRIDAY INTRODUCTION TO YOUR KINDLE AT THE LIBRARY: At 10 a.m., Marianne Beck Memorial Library in Howey-in-the-Hills. Register for the free class at www.mylakeli -brary.org. SATURDAY COMPUTER TECH DAY AT THE LIBRARY: Learn how to use that new tech de -vice you got for Christ -mas, at 11 a.m., Helen Lehman Memorial Li brary, 17435 5th St., Montverde. Call 407469-3838 for informa -tion. SUNDAYLOW-COST PET VACCI -NATION CLINIC: From noon to 4 p.m., Irish Trails Farm and Pet Sup -ply, 102 S. U.S. Highway 27 in Clermont. Call 352-243-0924. TUESDAYHANDS-ON COMPUTER BASICS NAVIGATING THE INTERNET AT THE LIBRARY: At noon, Helen Lehman Memorial Library, 17435 5th St., Montverde. Call 407-469-3838 for infor -mation. JAN. 15MINNEOLA ELEMEN TARY SCHOOL CHAR TER BOARD MEETING: At 7 p.m., in the media center, 320 E. Pearl St., Minneola. Call 352-394-2600 for information. LEARN WINDOWS 8 COMPUTER CLASS AT THE LIBRARY: At 11 a.m., Helen Lehman Memo -rial Library, 17435 5th St., Montverde. Call 407-469-3838 for infor -mation. JAN. 16WHATS NEW IN TAX TIPS AND ESTATE PLAN -NING AT THE LIBRARY: At 10:30 a.m., Helen Leh-man Memorial Library, 17435 5th St., Mont verde. Call 407-469-3838 for information. JAN. 21 TOP SHELF BOOK CLUB MEETS AT NOON AT THE LIBRARY: Discussing Magic hour by Kris -ten Hannah. Marianne Beck Memorial Library, Howey-in-the-Hills. Call 352-324-0254.